In this edition that we have aptly titled ‘Hypermodern Classics’ due to regular references to high-tech and the tried-and-true, we look at a number of installations and trend directions presented at Ambiente, Christmasworld, Paperworld, and Creativeworld, all with corresponding Pantone color stories and design details. A number of home fashion product categories are covered this month. Get inspired with the March edition! Frankfurt — The stakes are being raised by both buyers and consumers—manufacturers take note! They demand product that is well-crafted, timely, sustainable, and priced appropriately. Many of the trend directions presented here take these into consideration. 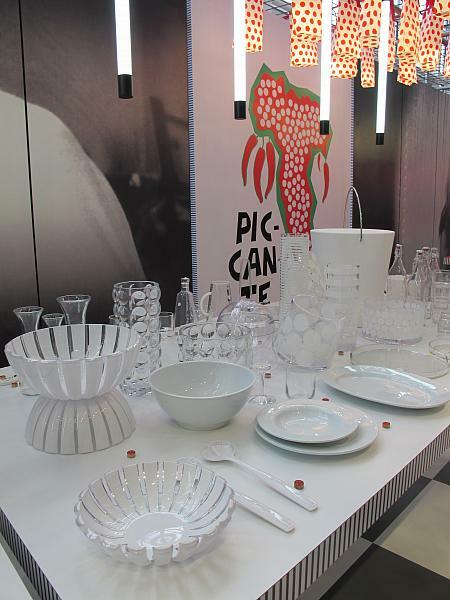 In this gallery see the oh-so-superb set-up of ‘Dulce Vita’ from Italy, partner country, curated by Paola Navone for Ambiente. 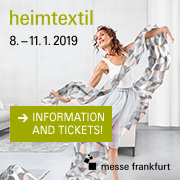 Frankfurt — The amalgamation of pioneering production technologies such as thermoplastic processes and traditional manufacturing methods envision new opportunities and make it possible to turn plastic, Perspex, rhinestones, metal and neoprene into ornamental and ecofriendly products. Refined molecular patterns, shadows, and delicate filigree textures afford features that amaze us and create an essence of science fiction. Frankfurt — With a whole new neutral color palette in white and grey tones, this design direction focuses on capitalizing on the functionality of the product. Reductionist design highlights exceptional workmanship and is influenced by the uses of materials in sports and architecture. The applications of glass, stainless steel, marble, concrete, and rubber in production accentuate the resilience of the products and add to a sporty, relaxed, and unisex appearance. Frankfurt — Glamour and pragmatic merits pair up to create an easygoing look that carries the uncommon into run-of-the-mill life. The main features are seductive materials and sensual, natural hues and motifs. A divergence of counterparts. In poised scenography, the Boho Treasuries direction combines an appetite for the ornamental and lavish with a love of the modest and natural. Frankfurt — “Comfort meets simplicity. Simple materials, clean finishes and neutral tones create a balanced look.” Less is more. Quiet Harmonies intentionally navigates away from attention-grabbing patterns and designs. Instead it permits unassuming, high-quality materials to stand out. The finishing is meticulous and often shows the marks of a handmade origin. The designs are simple, reduced, and minimalist. The Pantone color story is monotone in character. Frankfurt — In Playful Possibilities the normal becomes something special, and the traditional something unconventional. Familiar objects are rediscovered and brought to life again – vintage and retro are key trend-heavy adjectives. If mustaches had a home within a Christmas trend direction, this would be it. Unexpected and original, this Pantone color story may surprise you for seasons to come. Frankfurt — This week’s gallery shows off the creative interactive workstation at the show known as Creativeworld, a hobbyist and do-it-yourselfer’s dream come true. Subscribers can also dive in to the three trend themes merchandised at the Messe Frankfurt, Germany by following the corresponding links. Frankfurt — Letters, numerals and complete lines of text are printed, stamped, drawn, or used as cutouts. The graphics templates decorate greeting cards, notebooks, exercise books, and pencil cases, as well as t-shirts and mobile phone cases. The possibilities are extremely varied. Ideas can be elaborately developed or realized simply and rapidly. Frankfurt — Floral patterns in a combination with dark, sensual colors have an intensely attractive impact. Aubergine and deep blue, green and brown tones are effectively nuanced with warm, luminous orange. Painting, drawing, watercolor, embroidery, and modelling are used to create artistic, natural, and memorable effects. Frankfurt — Stone, marbles, and wooden structures are key elements in the design. Graphic textures give a sense of tranquility and modernity. In the restrained color palette of grey, sand, and gentle wood tones, the clearly structured surfaces are particularly effectively brought to the fore. Rough, brittle vividly applied concrete and granite colors stand in the stark contrast to clear glass, fine paper and pure-white linen. Frankfurt — This week’s gallery is for any of you who are looking for inspiration for holiday merchandising inspiration; 83 images that will make you look at things in a new light. Additionally, subscribers can delve into three trend themes outlined within, each with their own Pantone color palettes, materials, and carefully curated image selection. 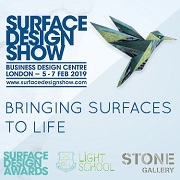 If you are looking for surface design direction, this will be a dreamland for you! Frankfurt — Paper, office supplies, and stationary trends are brought to attention at Paperworld in Frankfurt, Germany. Yet again the design studio bora.herke.palmisano analyzes international trends in fashion and art, interiors, and lifestyle to translate the design directions into market-right directions for this market. Graphic Vitality, Essential Serenity, and Floral Liberty will be leading the 2016/2017 seasons. Frankfurt — The conscious reduction to essentials directs attention even more strongly to the high quality of the materials. Cool and warm tones maintain the balance in a restrained palette of colors. A series of neutral colors are used, such as milk-white, stone, and light grey, as well as cloudy blue tones, graphite black, and dark taupe. Frankfurt — Floral Liberty is an extravagant style that occupies a space between flower power, retro folklore, and Bohemian festival. The pivotal elements are highly decorative patterns that appear playfully on all materials and surfaces. Everything is printed, patterned, and decorated. The boundaries between masculine and feminine design are broken down.